Download "Center for Promoting Ideas, USA www.aijcrnet.com"
1 Assessment of Counselling Needs Related to Mathematics Performance among Secondary School Students in Maara District, Kenya 76 Monicah Buyatsi Oundo Department of Education (Guidance and Counselling) Dr. Veronica K. Nyaga Senior Lecturer Department of Education Dr. Hillary K. Barchok Dean, Faculty of Education Mary Murangi Mureithi Department of Education (Guidance and Counselling) Abstract Dismal performance in mathematics by students has continued to curtail their admission into strategic professional courses both at midlevel colleges and universities. 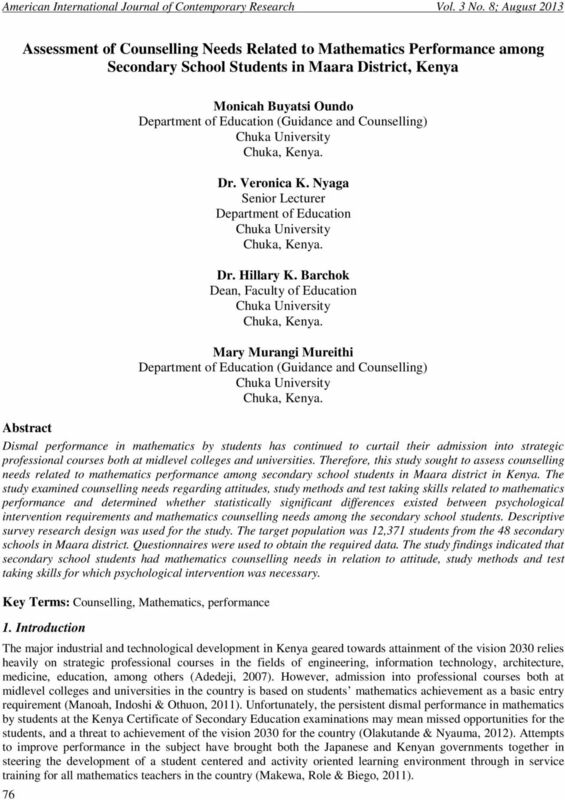 Therefore, this study sought to assess counselling needs related to mathematics performance among secondary school students in Maara district in Kenya. 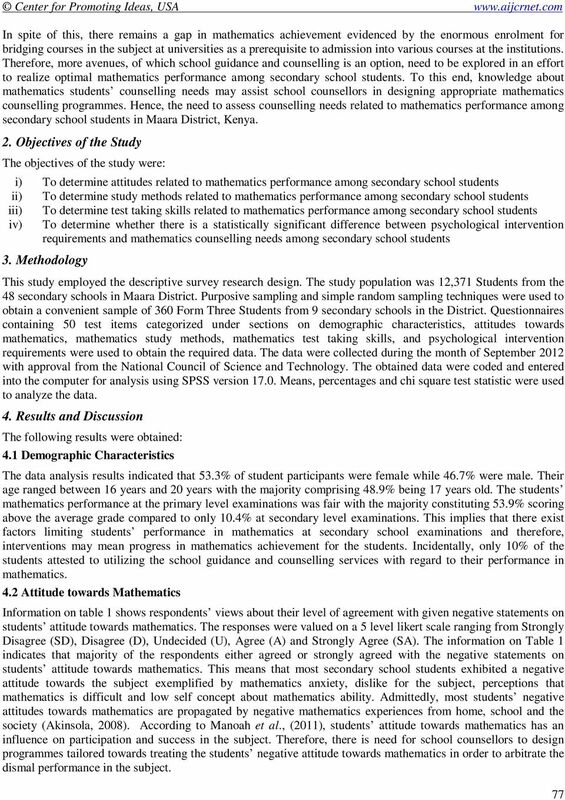 The study examined counselling needs regarding attitudes, study methods and test taking skills related to mathematics performance and determined whether statistically significant differences existed between psychological intervention requirements and mathematics counselling needs among the secondary school students. Descriptive survey research design was used for the study. The target population was 12,371 students from the 48 secondary schools in Maara district. Questionnaires were used to obtain the required data. 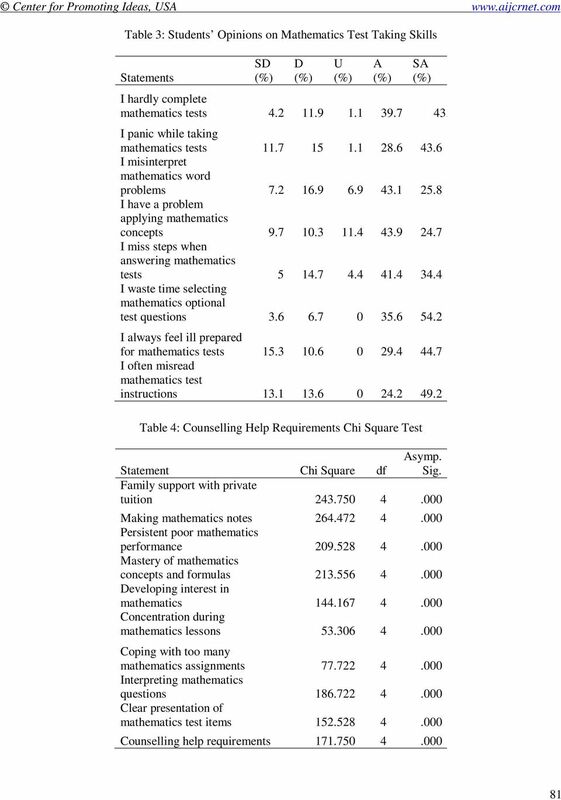 The study findings indicated that secondary school students had mathematics counselling needs in relation to attitude, study methods and test taking skills for which psychological intervention was necessary. 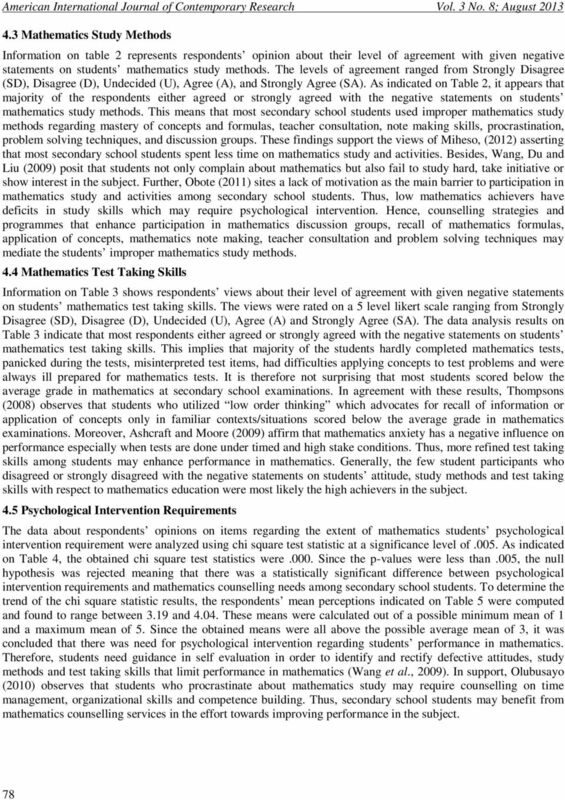 Key Terms: Counselling, Mathematics, performance 1. Introduction The major industrial and technological development in Kenya geared towards attainment of the vision 2030 relies heavily on strategic professional courses in the fields of engineering, information technology, architecture, medicine, education, among others (Adedeji, 2007). However, admission into professional courses both at midlevel colleges and universities in the country is based on students mathematics achievement as a basic entry requirement (Manoah, Indoshi & Othuon, 2011). Unfortunately, the persistent dismal performance in mathematics by students at the Kenya Certificate of Secondary Education examinations may mean missed opportunities for the students, and a threat to achievement of the vision 2030 for the country (Olakutande & Nyauma, 2012). 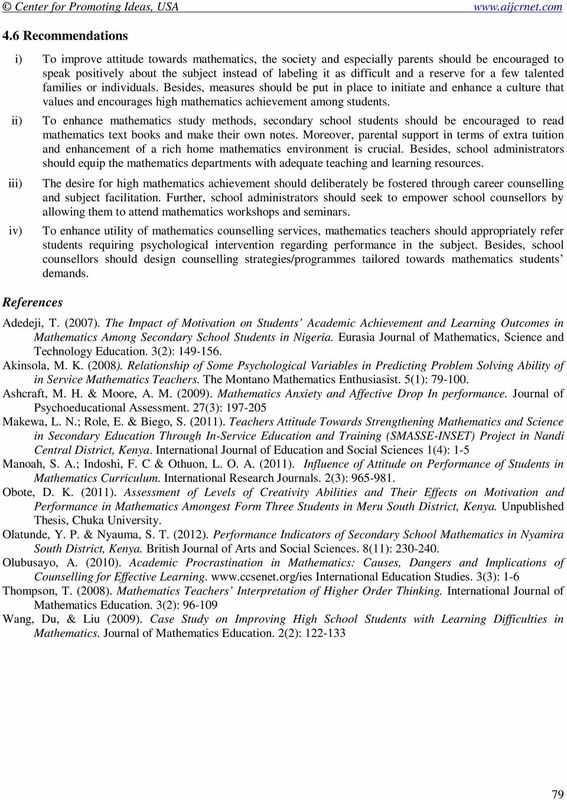 Attempts to improve performance in the subject have brought both the Japanese and Kenyan governments together in steering the development of a student centered and activity oriented learning environment through in service training for all mathematics teachers in the country (Makewa, Role & Biego, 2011). What are the Effects of Comprehensive Developmental Guidance Programs on Early Elementary Students Academic Achievement? 1. To identify 10 communities in Northern Colorado in high need of social skills group therapy. 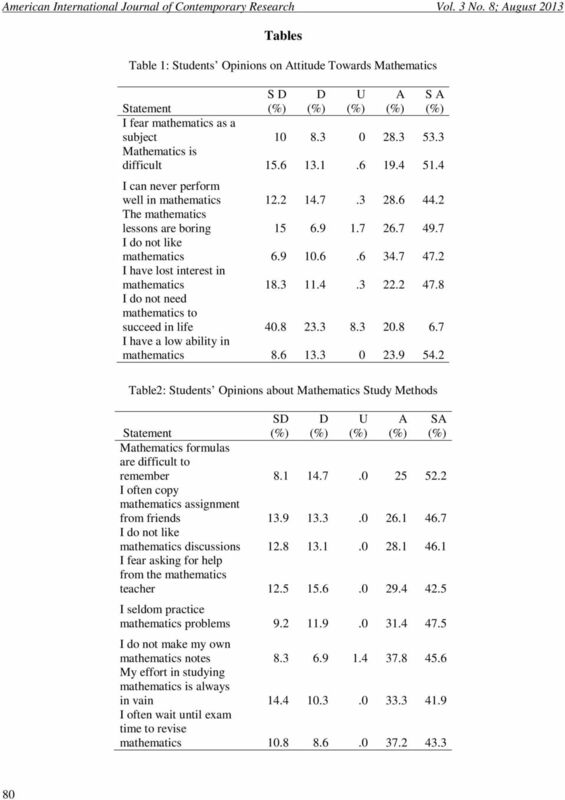 Problems arising from streaming mathematics students in Australian Christian secondary schools: To stream or not to stream?